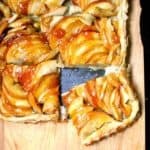 An elegant and easy vegan French Apple Tart that looks deceptively complex, but comes together in less than 20 minutes. Sliced apples are arranged on a golden puff pastry base and all of this deliciousness is amped up by an apricot glaze. A vegan, soy-free and nut-free recipe. Mix the apples with the sugar in a large bowl. Roll out the puff pastry sheet to fit in your tart pan. I used a 12 X 8 inch rectangular pan with a removable bottom, but a round one would work too. Place the puff pastry inside the pan and press in the sides to fit to the pan. You can use a rolling pin to cut any overhanging pastry dough, or tuck it under the edges to get a neat look. With a fork, prick the dough all over to keep it from rising in the pan. Layer the sliced apples inside the puff pastry in a decorative pattern, tucking any small pieces into the corners to ensure the surface is evenly covered. If you're working with a round pan, you can layer them in concentric circles. Place the tart on a rimmed baking sheet to catch any juices that spill over, and then in the oven. Bake 45 minutes, turning around once halfway through baking. Remove to a rack. Heat the apricot jam with the water or liqueur in a small saucepan until it's runny enough to work with. Brush on top of the apples once the tart is out of the oven. If your pan has a removable bottom, unmold before the tart cools down completely because any running juices could cause the pastry to stick to the pan. Continue cooling on a rack. Slice and serve at room temperature.